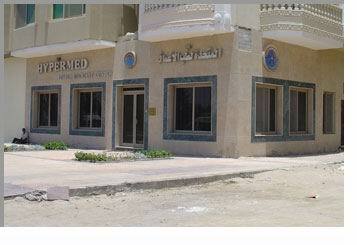 The newest DECO Chamber facility in Hurghada located right opposite of the airport. On arrival you sign up for insurance pay around €6, get a card and you're insured for three weeks. Hypermed, a medical organization specialized in the field of diving and Hyperbaric medicine has started in 2006 to operate in Hurghada with a diving medicine clinic and has launched its first Recompression and Hyperbaric Chamber in june 2007 in a complete diving emergency center in front of the Hurghada Airport. **Hypermed members have the privilege of phone consultations for diving related problems all the time. **Diving Staff of Hypermed affiliated diving centers and safari boats are automatically members having the service of treatment in the decompression chamber in the event of a diving accident. Residents divers( Foreigners and Egyptians)Cost: 6 Euro Hypermed offers the same 2 previous programs with the same cost.Tourist divers ( diving center divers and safari boats)Hypermed offers the Diving Assistance Program for the duration of 4 weeksmembership that covers the treatment in the decompression chamber in the unfortunate event of a diving accident(decompression sickness or air embolism).